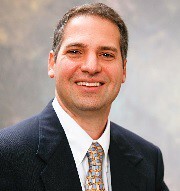 Post written by Dr. Harry Aslanian from the Section of Digestive Diseases at Yale University. We thought it would be interesting for non-endosonographers to see how easily and quickly ROSE can provide diagnostic information. Among endosonographers, there is local variation in cytopathologists’ comfort level with pancreas cytology and variable interest in ROSE. While some centers have moved away from ROSE and utilize a fine needle biopsy (FNB) –based approach, we continue to find ROSE valuable to ensure that we will have a diagnostic sample. We utilize ROSE to guide adjustments to FNA/FNB site selection and/or the amount of suction or needle size utilized, when the initial passes are not diagnostic. We utilize 25 gauge FNA needles with the stylet-pull technique to maximize ROSE analysis by minimizing blood in the sample. We are able to provide the patient a diagnosis of malignancy in the majority of cases at the conclusion of the procedure. 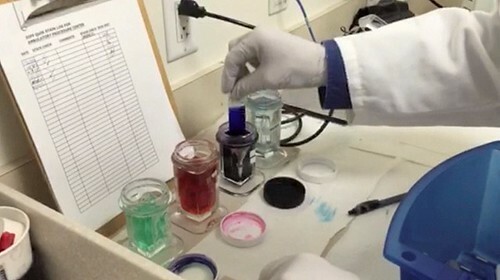 In addition, ROSE may guide specimen handing and evaluation to obtain the greatest amount of diagnostic information, such as the placement of material in RPMI for flow cytometery in cases of suspected lymphoma and ensuring an adequate cell block is available in cases of suspected neuroendocrine tumor or solid and papillary neoplasm of the pancreas. Figure 1: Diff-Kwik staining of a slide for rapid on-site evaluation (ROSE).